A powerful documentary film by Werner Herzog about the life and death of Timothy Treadwell. Lions Gate USA R1 DVD. Timothy Treadwell spent thirteen summers in the remote Alaskan country, living alone with the wild bears, hoping to befriend and protect them. For five of those years he took a video camera with him and started to film both the bears, and himself, making footage that could be used in a documentary, and recording his own personal feelings to the camera. In 2003 he was killed by one of these bears. German born director Werner Herzog is best known for his work with actor Klaus Kinski, but has also done a lot of work with documentaries, from the completely freeform Fata Morgana (1971) to the more conventional Little Deiter Must Fly (1997). 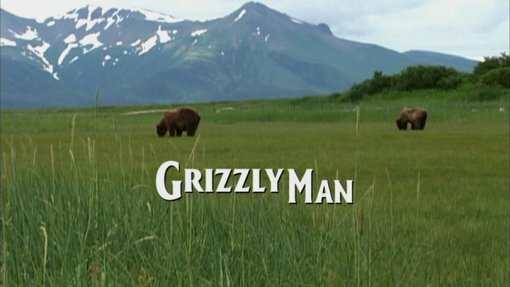 Grizzly Man is in the latter camp - at first glance a relatively straight forward documentary, that Herzog manages to fill with a unique atmosphere. The first shot of the film really sets the tone, some of Treadwell's footage of himself, describing how easily he could fall victim to one of the bears if he showed weakness - but instead of stopping the shot when Treadwell clearly plans to cut it, Herzog lets the footage run on longer to show Treadwell comment to himself, and walk up to the camera to stop it. Throughout the film Herzog takes real advantage of this unedited camera footage, to show us both the public image of Timothy Treadwell, and the rather haunted man himself. During the course of the film we get a full biographical account of the life of Treadwell, from his parents and his friends. The film does not shy away from detailing some of the dark times in his life, an addiction to drinking, and associations with criminal gangs, but equally it never dwells on these aspects, and we also hear about his voluntary work, touring schools to teach children about the bears and show his footage. Much to its credit the film maintains this very balanced tone throughout, from interviewees who openly criticise the man and his beliefs (notably his paranoia about poachers), to others who all but praise him for his dedication and hard work. As usual for his documentaries, Herzog himself provides the narration and although remaining quite neutral for most of the time, becomes quite open in his own feelings towards the end of the story, challenging Treadwell's belief that nature is inherently good and kind, with his own view that nature is naturally destructive and in chaos. Herzog is also uniquely placed to comment on Treadwell's footage, from the perspective of a fellow film maker, and appears to greatly admire some of the shots that he was able to get. On a documentary of this sort, there is a real danger that the end result could become gratuitously shocking, or sappy and emotional. Again Herzog manages to capture a very fine balance. He does not shy away from the brutal way in which Treadwell was killed, and we hear some particularly vivid descriptions, but although Herzog refers to photographs of the site of the killing, seen at the coroners office, and at one point is seen listening to the audio recording that Treadwell made of his own death, we never see or hear these in the film. Several of the interviewees break down into tears during their talks, and it is testament to Herzog's skill as an interviewer, that he neither exploits or hides this from the viewers. Herzog's own footage is used sparingly, but his location shots still reveals his talents for finding a beautiful landscape, while his interviews are reflective of the documentary as a whole, letting the camera run on a little longer than expected, to show the real emotions that come out. The musical soundtrack is very interesting - an entirely improvised score, recorded by musicians watching the film after it was completed (extensively covered on the Grizzly Man Session documentary included on this DVD). Largely guitar based, this score is very effective and fits the mood of the film perfectly. The pacing is strong throughout, although the subject could have been covered in a simple 30 minute television slot, he explores much deeper and manages to easily fill the 100 minute run-time without any padding or dragging. From The Enigma of Kaspar Hauser (1974) to Death for Five Voices (1999) Werner Herzog's work is filled with tributes and fascination to unique men, and Timothy Treadwell is a perfect example. Again Herzog has proven himself the master of the documentary format, managing the rare art of making a film that is completely balanced, and leaves the viewer to make their own judgment. Certainly among the best of Herzog's impressive oeuvre, this film is highly recommended to all. Directed by anyone interesting? Werner Herzog - one of European cinema's best directors who carries a powerful artistic vision in all his films, his other documentary works include Little Dieter Needs to Fly (1997) and Fata Morgana (1971). Any violence/gore? Some brief shots of dead and mutilated animals. Everyone. Fans of Herzog especially should really enjoy this. Visuals Original Aspect Ratio - 1.78:1 anamorphic widescreen. Colour. The picture quality is perfect with no print damage. The parts of the film comprised of Treadwell's own DV camera footage are slightly lower quality, but still easily watchable. Audio English stereo. Sounds fine. Grizzly Man Sessions - A look at the scoring of the film by a group of musicians, supervised by Herzog. Very interesting with some good long tracks from the soundtrack. (50 minutes). Non-anamorphic widescreen. Trailer reel of other Lion's Gate films. Other regions? Available in the UK and Australia in near identical DVD releases (a very minor change to the print in these editions, they are missing the NBC news segment, detailed below), with some different features. See DVD Rewind for more. Cuts? This film has been slightly altered from the original cinema release - due to rights issues, a shot of Treadwell on the David Letterman show has been replaced by an NBC news item. On the R2 and R4 prints, this segment is completely removed. Only a very minor change that most viewers will not notice. A fascinating and well balanced documentary, one of Herzog's best, and among his best works. Highly recommended to all. Good looking and sounding print, with an interesting documentary feature. All text in this review written by Timothy Young - 25th August 2007 - review number 200!